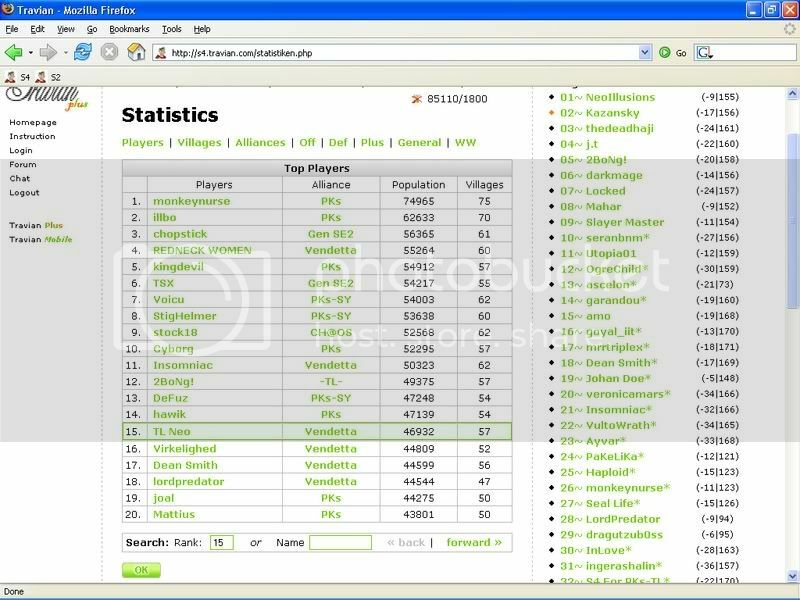 10 months ago, FakeSteve introduced TeamLiquid.net to the massively multiplayer online real-time browser game: Travian. 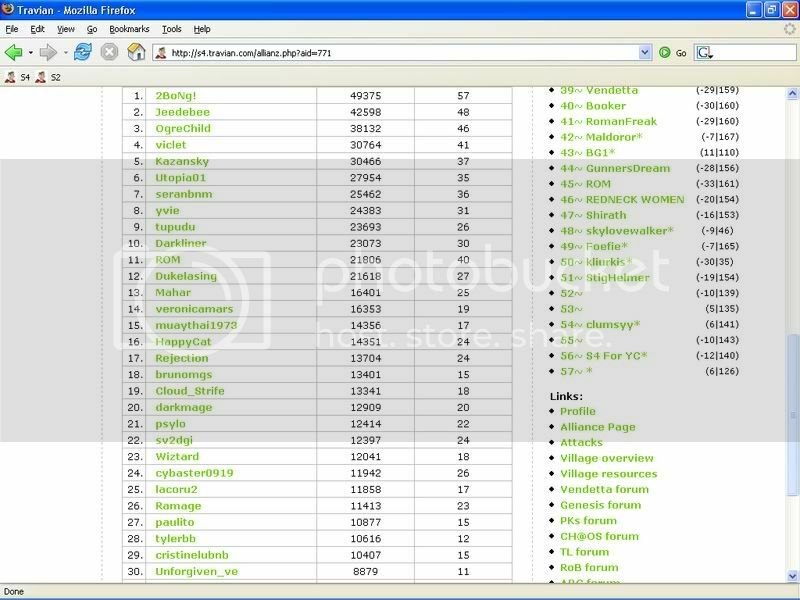 A large number of TL.net members showed interested in the game as it was another opportunity for our community to game together. Within a day or two, we all became denizens of the NorthWest quadrant of Server 4. TeamLiquid started out 3 alliances strong with over 80 players from our home forum. Each player starts off as one of the three tribes: Gauls, Romans, or Teutons. 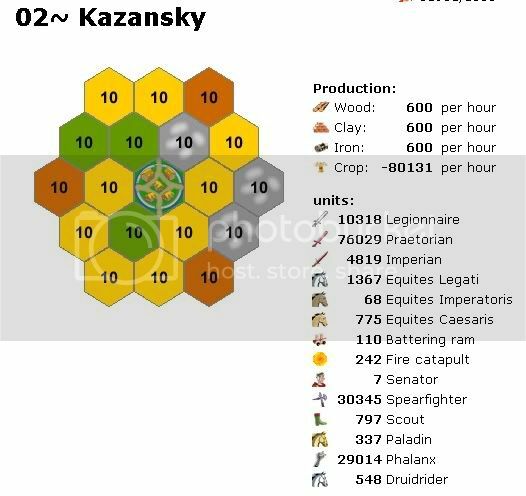 The game is very much like Civilization, in which players building up their villages, produce units to attack and defend, and gather resources. Like with other MMOGs, group cooperation and communication is a must. One of the great things about playing a MMOG with a community like TeamLiquid is the innate sense of trust we have with each other. Other alliances in this game suffer from espionage and corruption within their own ranks. -TL- was able to bypass such issues for a good 4 months into the game. Over the course of the game, we found two strong allies. First was Youth Climbers (YC) in the NorthWest, a group of rock climbing enthusiasts from Hong Kong. Our mid and late server ally was Player Killers (PKs) from the NorthEast. PKs was formed from the most aggressive players in the NE. Early on, we were dividied into 3 alliances based on where in the NW we spawned. As it was our first time playing this browser based game together, we were a rather rag-tag bunch. Steve started a thread and listed all the players and their coordinates. But after a while, Steve disappeared and people started asking on the forums about what our goals should be and how we should continue. This is when I took it upon myself to coordinate things for TL.net. I created a new thread and updated it with a new roster and a few maps/guides. To win a Travian Server, a player/alliance must build their World Wonder to level 100. At level 1, the WW takes 5 hours to build. Each level there after, there is proportional time increase. All the way up to level 100, this takes over 30 hours to build. The first 6 months of the game, players and their respective alliances play for territorial dominance. -TL- and our allies, YC, ended up being the strongest in the NorthWest. 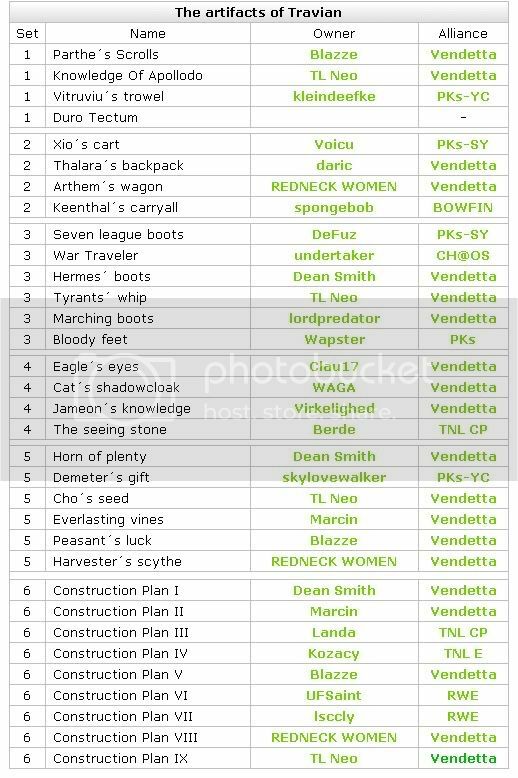 About the start of month 7, artifacts are released. Artifacts spawn in NPC villages and possess immense defense. Alliance coordination is required to time all the attacks one after another and ensure that the person who sends the last attack is able to pick up the artifact and secure it in one of their villages. After all the artifacts are secured, the last portion of the game begins. World Wonder Plans are released. WW plans are just like Artifacts. Only difference is that the player holding the WW plan will be able to construct a World Wonder “building”. Each player with a WW plan can build their Wonder from level 1 to level 50. To build the Wonder to level 51 and beyond, another player in the same alliance must also hold a plan. Another words, 2 players in the same alliance must each have a World Wonder Plan in order to build their respective alliance World Wonder to level 100. At the end of the server, it no longer becomes players fighting players or alliances fighting alliances. 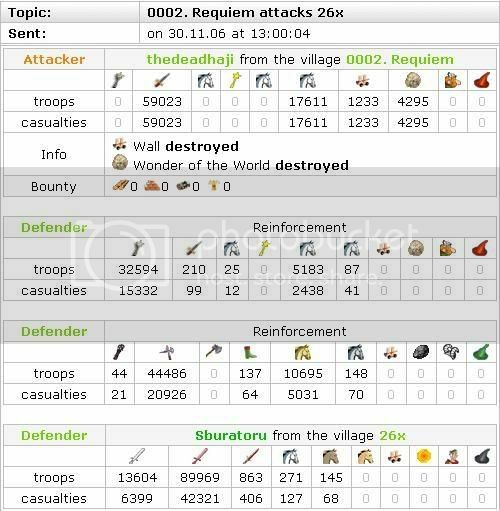 Like all other Travian servers, two metas (think an alliance of alliances) form and two factions of the server fight in the end. -TL-, YC and PKs ended up belonging to a meta named Vendetta. Our opposing meta was Genesis, a conglomeration of two multi winged alliances, RoB and ABC. There are a few people who made this Travian experience a success for TeamLiquid and to them, I would like to give them my thanks. Kaz was the other main coordinator for -TL-. He essentially kept things running smoothly when wars arise and when I got rather busy in real life. For the first five months, Kaz was the most aggressive player on Server 4. He single-handedly put our alliance on the map for other to notice. Probably one of our more newbie of players. But given how he started Travian a good two months after the rest of us, he’s got a good excuse. PaKe was persistent in trying to make himself useful in our alliance. He took over Petachu’s account after Peta went inactive. The last two months of the game, I made him my co-player and he covered tasks while I was busy sleeping or studying. One of our key players who stayed until the very end of the game. haji was responsible for building up the largest single army in Travian. This meant constantly raiding for at least a good three months in advance to build up his army and make sure it didn’t starve. Using his badass army, haji killed Genesis’s World Wonder and essentially seal the victory for our side. TeamLiquid’s resident celebrity... WINKTOSS! I was rather surprised to learn that Leg was playing Travian with us when this all started. He was our strategic commander. What Kaz had in terms of brute force, Leg executed with great finesse. 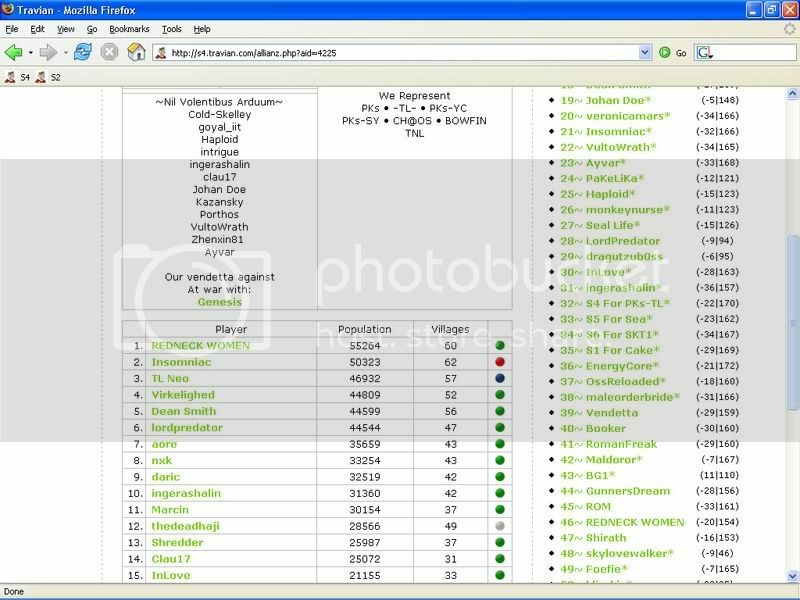 I would say that over 5 enemy players lost a total of about 60 villages in a period of a month, all due to Leg’s planning. Giving me insight on not only who to hit but also when and with how big of a force, Leg filled in the gap left by Kaz after Kaz retired. To our script writers, you guys saved us time galore. To all our TeamLiquid.net members who played with us. I hope Travian was a fun experience for you while we all gamed together. Ascelon and garandou, I acknowledge you two as probably the better players on our forum. If only you guys actually stayed on Server 4 with the rest of us. 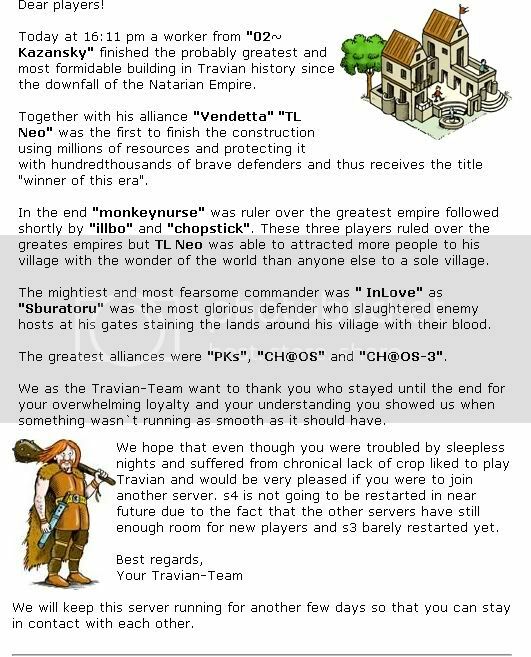 To FakeSteve, the person who introduced all of us to Travian, only to quit 2 weeks later. Set 5: artifact owner's crop upkeep is reduced by 1/2. For the Glory that is TeamLiquid. Final thanks to our beloved forum administrators: Liquid`Nazgul, Liquid`Meat, Saro, Manifesto7. TEAM LIQUID OWNS THE INTERNET AGAIN! Each server takes 10-11 months to finish. Early on, it's not that hard to manage. But as the game progresses, you have more and more villages/units to control. At the end, I had 57 villages to look after. In all the sense of the word, Travian is truly a committment if you want to play successfully. i don'T know this game, but enjoyed the read. Indd! You beat the internet! TL Fighting! You made us all proud <3. maybe TL should start playing in the lottery. thanks, good read, i totally missed that. but yea, life was hell while this game went on, but honestly, this game is the sole reason I got closer to many people on TL.net like Neo, intrigue, locked, geometryb, anihc, Leg, decaf, Wow, etcetc. That alone makes the 10 month commitment worthwhile for me. anyhow... more power to TL. good job guys. Entropy smells trouble, he realizes a foreign game (i.e. not StarCraft) stole StrarCraft players and shouts, Strategy game or not this is almost sacrilegious!, while he muses about our demise. "Oh quiet down man, remember how you end all your posts with "Enjoy ~" , replies Physician as he wonders about the fickle interest of gamers, while at the same time he wishes he were younger and had even more time for more games, than just the one. "I have beheld the births of negative-suns and borne witness to the entropy of entire realities...."
its like utopia.. anyone played that online txt game b4?